(JNS) Ahead of November’s midterm elections, much Jewish communal concern and debate has centered on the anti-Israeli views of Democratic congressional candidates such as Alexandria Ocasio-Cortez and Rashida Tlaib in New York and Michigan, respectively, coming against the backdrop of the growing partisan divide on Israel. Meanwhile, in New England, a young Democrat with a rising national profile and highly recognizable surname is running unopposed for a fourth term in the region’s most Jewish congressional district. 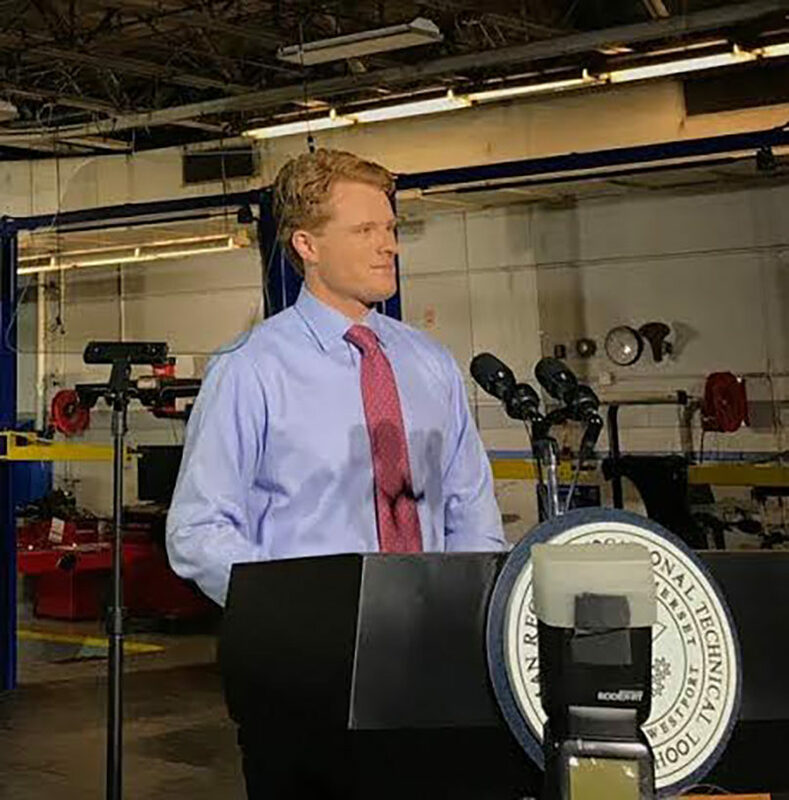 As rumored 2020 presidential candidate Rep. Joe Kennedy IV (D-Mass.) – the grandson of Sen. Robert F. Kennedy, grandnephew of President John F. Kennedy, and son of Rep. Joseph P. Kennedy III – more frequently assumes the spotlight through platforms like his rebuttal of U.S. President Donald Trump’s State of the Union address, the 38-year-old lawmaker’s policies on Israeli and Jewish issues could draw increased attention. Brett M. Rhyne, editor of The Jewish Advocate in Boston, believes that Kennedy “is in a somewhat challenging position vis-à-vis Israel and the Jewish community” in his district, which includes the heavily Jewish areas of Brookline and Newton. In January’s State of the Union rebuttal, Kennedy’s line of “You steadfastly say, black lives matter” might not register as relevant to Israel for the average observer. Yet the official Black Lives Matter (BLM) movement’s platform calls to end “US aid to Israel’s military industrial complex,” and accuses Israel of “apartheid” and “genocide” against the Palestinians. Dream Defenders, a BLM offshoot, in 2016 took a tour of eastern Jerusalem and the West Bank that was led by a member of the Popular Front for the Liberation of Palestine terrorist group. “I don’t see how Representative Kennedy can support Black Lives Matter while choosing strategically to ignore its anti-Israel platform,” Jason D. Hill, a black immigrant from Jamaica and author of We Have Overcome: An Immigrant’s Letter to the American People, told JNS. Kennedy’s office pointed to his co-sponsorship during this current Congress of H.R.5141 United States-Israel Security Assistance Authorization Act of 2018 and H.R.5132 Iranian Revolutionary Guard Corps Economic Exclusion Act. This election season has seen a surge in far-left candidates emerging within the Democratic Party that have been accused of holding anti-Israel views. New York Democratic candidate Alexandria Ocasio-Cortez, who upset longtime incumbent Rep. Joe Crowley in a party primary in June, has accused Israel of committing a “massacre” in the Gaza Strip. Similarly, Minnesota Democratic candidate Ilhan Omar has also previously accused Israel of “evil doings” and of being an “apartheid state.” Similarly, Leslie Cockburn, the Democratic candidate for Virginia’s fifth congressional district, wrote a book back into the early 1990s titled Dangerous Liaison: The Inside Story of the U.S.-Israeli Covert Relationship that has been panned for peddling conspirancy theories and smears that depict Israel as manipulating U.S. foreign policy. CAP: U.S. Rep. Joseph Kennedy (D-Mass.) delivering his response to President Donald Trump’s State of the Union address in January 2018. Credit: Joseph Kennedy via Twitter. When Nicholas Winton, the British rescuer of Jews, was rebuffed by the U.S.